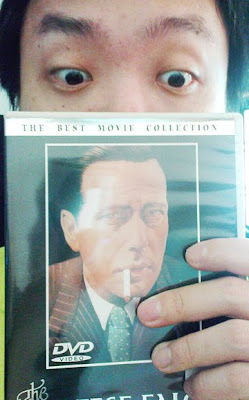 BIG MOVIE FREAK: The price you pay for original? The price you pay for original? Caveat emptor... let the buyer beware! 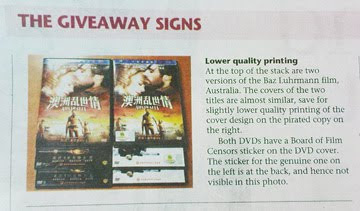 According to the Sunday Straits, video stores have been unwittingly peddling pirated wares forged by the Jack Sparrows of the movie industry, whose scanning and Photoshop skills have shown marked improvements. However, this is not the first time poop like this has happened. 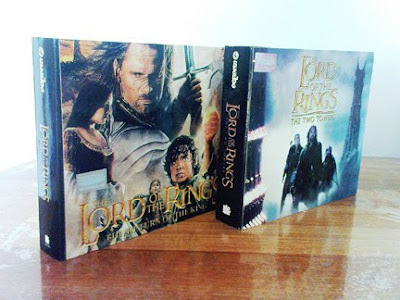 Many ages ago, a video store with a name that rhymes with "taser" brought in purportedly original VCDs of Lord of the Rings: The Two Towers and Return of the King from Thailand, mere weeks after the theatrical release. Took a while before anyone noticed the aquatic stench, including yours truly, who was at the time just too elated to have the opportunity to revisit Middle Earth at such short notice. The company was slapped with a million-dollar fine for its efforts; unfortunately I can't seem to track down the original news article about this fiasco. Hopefully, the evidences of my gullibility, as pictured on the left, would suffice. Anyway, the article suggests that we should all become digital artwork analysts and look out for slightly "pixellated" graphics, in order to guard ourselves from these fakes. 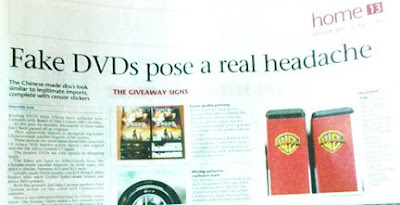 We know how busy the officials are, catching those pesky teen downloaders and fining holiday-ers who bought the same fake DVDs abroad; we must do our part to protect the billion-dollar movie industry from losing millions. Actually, there is an easier and quicker way to spot a dodgy DVD - if an English movie has big Chinese titles on its cover, avoid buying it. This will reduce your chances of making a bogus buy by about maybe 99, 100%? Err... Then again, maybe not.